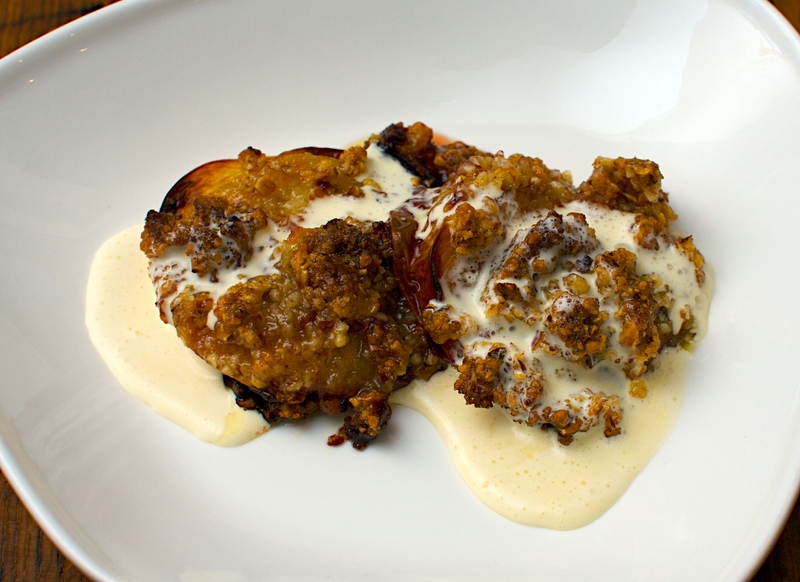 The peaches at the moment are really tasty so we’re gorging on them while they’re in season. Here are two easy and delicious dessert recipes to distract ourselves from just eating the peaches fresh. Preheat the oven to 180ºC. 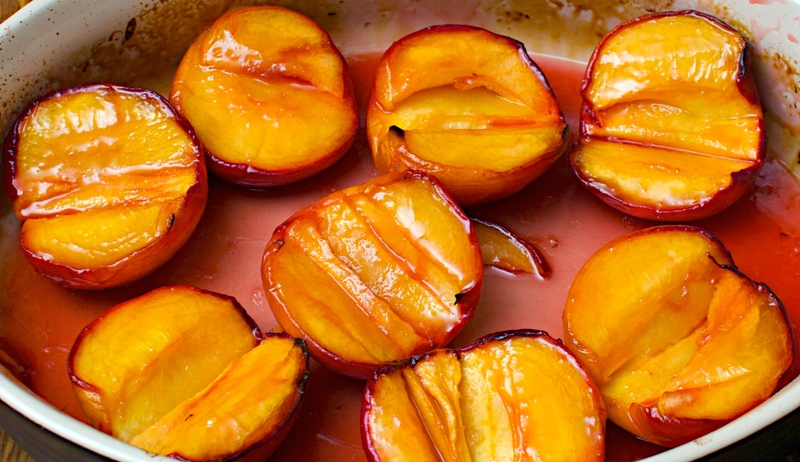 Cut the peaches in half, remove the stones and put them in a shallow baking dish cut-side up. Blitz the almonds in a food processor until you have a coarse rubble. Add the sugar and butter and mi again briefly. 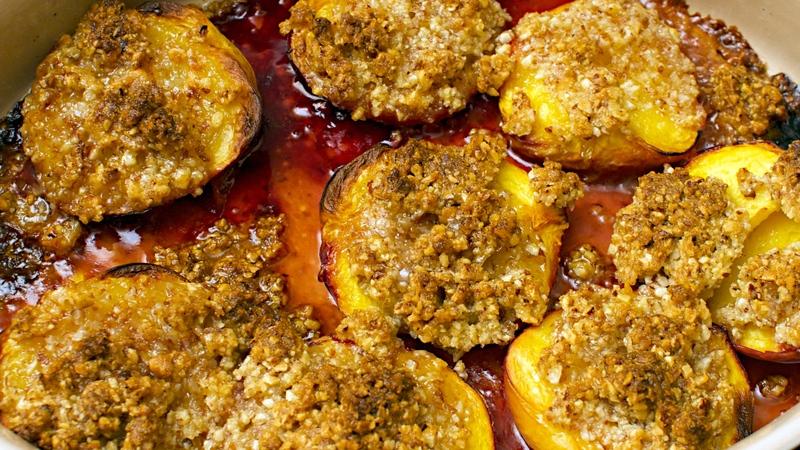 Spoon the almond mixture on top of the peaches and bake for about ¾ of an hour or until the peaches are super-soft and the topping is crispy. Pour a little double cream over to serve. Preheat the oven to 200ºC. Cut the peaches in half, remove the stones and put in a shallow baking dish cut-side up. Pour the maple syrup into a bowl. Scrape the vanilla seeds from the pod and add to the maple syrup along with the lime juice. Bake for about 35 minutes or until the peaches are really soft. Baste them occasionally while they cook. Drink with: a fragrant and slightly frothy Moscato d’Asti from the Piemonte region in Italy. Moscato is a completely under-rated wine that is fruity and light (about 5% alc.) and won’t overwhelm the dessert. We find that Moscato is quite often a much better match for fruit based desserts than traditional, much sweeter, “dessert” wines.